Garnet stone set in white gold with White Diamonds in band. Signifying loyalty, trust and friendship, this stones also has the power to bring good health, which is why its a very popular birthstone for a gift. The garnet comes in a variety of colours, most commonly seen in the deep red colours, which represents the pomegranate seed. With such amazing qualities, this gemstone can be made into some exquisite jewellery to suit any occasion and anyone. 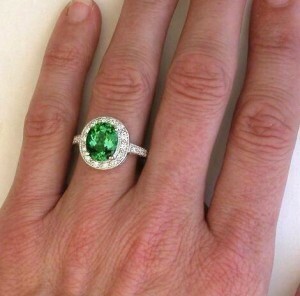 Glorious green garnet surrounded by white diamonds, set in white gold. 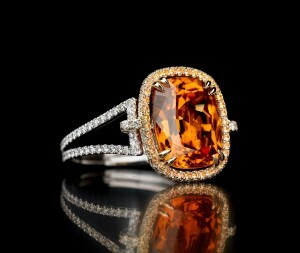 Beautiful mandarin garnet with dainty white diamond and white gold band. 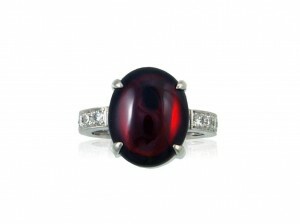 Speak to Coloured Stones today about creating a truly amazing and unique jewellery piece using your favourite coloured garnet.